In accordance with the current strategic Plan, “Vision in Action”, SCOR is enhancing the organizational structure of its large corporate risks insurance unit, SCOR Business Solutions, to increase client centricity. In accordance with the current strategic Plan, “Vision in Action”, SCOR is enhancing the organizational structure of its large corporate risks insurance unit, SCOR Business Solutions, to increase client centricity. Laurent Rousseau, who was appointed Deputy CEO of SCOR Global P&C on April 1, 2018, leads SCOR Business Solutions. The new organizational structure builds on the strengths of SCOR Business Solutions: a sustained track record of profitability, a strong technical culture, and nimble positioning in the (re)insurance risk transfer chain, supported by SCOR’s best-in-class financial strength rating. It combines greater business leadership and client and broker relationship management at a local level with global Line of Business expertise and a wider offer of products and solutions, with a view to being more relevant to clients and brokers. With broader portfolio underwriting and management capabilities through technology and innovation, SCOR Business Solutions is building an agile and scalable organization within the P&C division. 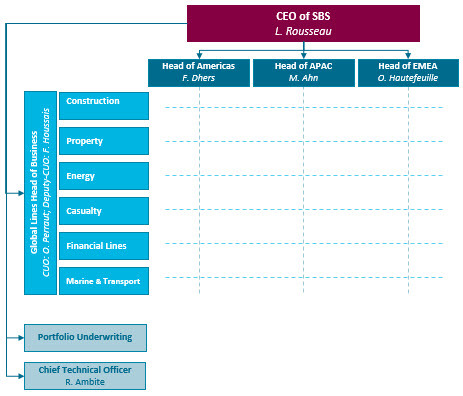 SCOR Business Solutions is now structured around three regions (EMEA, APAC, Americas), six global lines of business (Construction, Property, Energy, Casualty, Financial Lines and Marine & Transportation), a newly created Portfolio Underwriting unit, and a Chief Technical Officer. Clients in each region are served by specialist underwriters, who draw on global technical business line expertise as well as the regional or global client relationship.